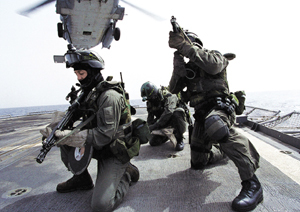 SEAL Team Two members take up guard positions outside of a SH-60 Seahawk from Helicopter Anti-submarine Squadron One Five. Defense Department officials are looking for new technologies, especially collaboration tools and advanced sensors, to support special operations around the world. "We have to move ahead in a way in which we can share information with our coalition partners," said Tom O'Connell, assistant secretary of defense for special operations and low-intensity conflict. O'Connell recently addressed an industry gathering of the Washington chapter of the Armed Forces Communications and Electronics Association in Arlington, Va. Before his appointment as assistant secretary of defense, O'Connell served as a senior manager for Raytheon Co.'s Intelligence and Information Systems division. Jeffrey Nadaner, deputy assistant secretary of defense for stability operations, said the department has a growing interest in adopting emerging technologies for operations other than war. He also emphasized that new technologies must be easily shared with partner nations. "They need to be fairly simple to use and require little training," Nadaner said. The Office for Stability Operations has a particular interest in sustainable information-sharing networks, Web-accessible databases, remote surveillance technologies, ruggedized handheld devices and convoy tracking and protection capabilities, Nadaner said. Special ops also have technology requirements for fighting narcotics trafficking and terrorism. Chief among them are better systems to sense and defeat improvised explosive devices. "If there's anything that can improve detection" of improvised explosive devices, it would mark a significant advance, "especially when those devices are on the move," said David McCracken of the office's counterterrorism group.